Germany&apos; first dreadnought. At this point Tirpizt opposed the use of a steam turbine:"the use of turbines in heavy warships does not recommend itself". Fitting out heavily delayed when a dockhand removed a plate by error. The ship had to be pumped out before work could be resumed, Cost 37,399,000 marks. All Action reported in CET.Divisions in the battle line consisted of the III, I and the II. Nassau was third ship in her division. 17:48 - 17:52 engaged the forward scouting group of Beatty&apos;s BCF, the 2nd LCS.Reputed to have scored a hit on Southampton at 20,100 yards at 17:50.Shifted fire to Dublin and ceased fire at 18:10.By 18:33 firing on Warspite2nd in the battle line behind König. GK engaged Princess Royal at 21,000 yards after Scheer closed in at 17:45 to get the British battle-cruiser range. 18:00 shifted fire to Valiant "after the faster British ships began to pull away from their pursuers" (Wiki). 22:00 Royalist, Comus and Caroline spotted. Royalist and Caroline fired torpedoes (one which runs under Wesfalen) despite Jerram&apos;s concern that these were british ships. At 00;00 Nassau comes into contact with the Spitfire where a ramming incident ensued. Nassau was damaged and had to slow to 15 kts. She was hit with two 4" shells from British destroyers.an hour later, at 01:00 came into contact with the Black Prlnce. 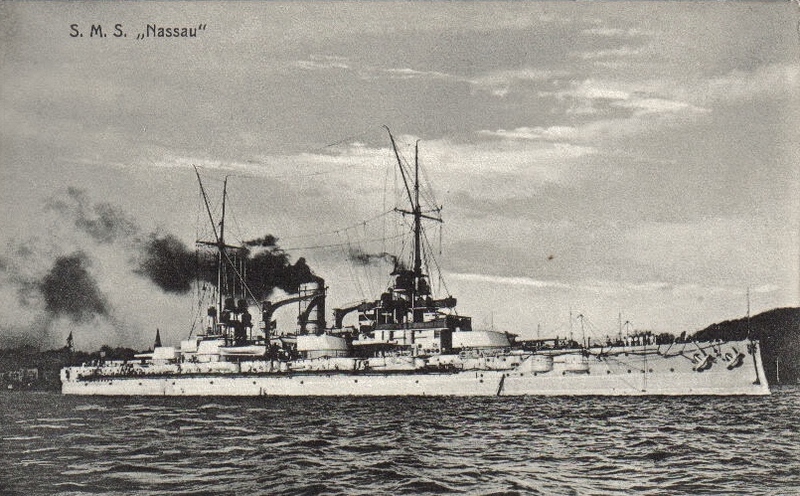 Thüringen let loose with 27 heavy and 24 secondary shells.Nassau, Ostfreisland and then Friedrich der Grosse joined in. Nassau had to reserve engines to avoid the wreck after the explosion and rejoined the line behind Hessen and Hannovr. Lastly, around 03:10 three to four destroyers again attacked at 5,500 yards. Nassau turned to starboard 90 degrees to avoid the torpedo.Then GK under fire from British battle line and hit 7 times 20:18 to 20:19, three of which were 13.5" shells from Marlborough. Barham or Valiant&apos;s 15" were the remainder. Destroyed the port side No.2 wing gun while the other hit the main belt causing 4 degree list after she took on around 800 tons of water (By the time she reached home waters, she&apos;d taken on around 3,000 tons).In the night formation was the 15th ship. Attacked at around 02:45 by 6 british destroyers. GK managed to hit one with 15 cm fire (the Nessus) and disabled her boilers.